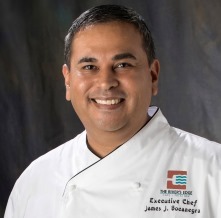 Executive Chef James Bocanegra is a San Antonio native with over 30 years of culinary experience. His focus is to maintain the highest culinary arts standards and support next generation culinary artists. Chef Bocanegra has deep roots at the Hilton Palacio del Rio. Growing up, his mother worked at the Hilton Palacio del Rio and James frequently visited the hotel as a child. While in high school, he worked as a bus boy at the 1980s hotel restaurant, El Comedor, located where The River’s Edge stands today. This sparked his interest in the culinary arts. After high school, James decided to continue his culinary education by enrolling in the culinary arts program at St. Philips College in San Antonio. While there, he worked as a full-time apprentice chef at the Hilton Palacio del Rio. Siegfried Richter, the Hilton Palacio del Rio general manager at that time, took note of James’s passion and potential. Mr. Richter supported Chef Bocanegra’s culinary aspirations and paid for his culinary arts education. After graduating from St. Philips, James worked as the garde manger chef for the Hilton Palacio del Rio. In 1987, Chef Bocanegra left the Hilton Palacio del Rio and continued perfecting his culinary talents at various hotels and restaurants across the United States including Myrtle Beach Hilton, Rye Town Hilton, Atlanta Hilton & Towers, Atlanta Airport Hilton, Miami Airport Hilton and Flamingo Hilton Laughlin. In 1999, Chef Bocanegra received a call from his mentor, Mr. Richter, asking him to return to the Hilton Palacio del Rio as Executive Chef. Almost twenty years after his first job as a bus boy, Chef Bocanegra returned to the hotel that launched his culinary career. Just as Mr. Richter supported him in his culinary career, Chef Bocanegra supports the next generation of culinary artists. Chef Bocanegra is a mentor to students at the Culinary Institute of America and hosts CIA externs during their 18 week foodservice and hospitality externship semester. Executive Chef James Bocanegra celebrates his 37th anniversary with Hilton Hotels this August and invites you to enjoy his American and South Texas inspired cuisine at The River’s Edge Cafe and Patio Bar.